In August 2007, I traveled to Europe with daughters Sarah and Rebecca. A highlight of our time in Paris was finding the church of Saint Nicolas Des Champs, the place of origin for some of our ancestors before leaving France for Quebec, Canada. At the time of its founding in 1067, the Abbey of Saint Martin des Champs was outside the walls of the City of Paris. It was incorporated into the city in the 14th century when it was enclosed by the new City wall constructed under the management of the Prefect of Paris, Etienne Marcel. 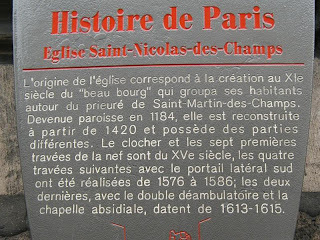 The church of Saint Nicolas des Champs was begun in 1420 and enlarged significantly in 1541. In 1615, another building project was completed that gives us the church we see today. 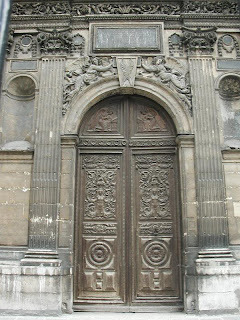 The Church of Saint Nicolas des Champs was a center for charitable works and a refuge for pilgrims until its closing at the time of the French Revolution. Closed in 1793, it was re-opened in 1795 as a temple dedicated to Faith. In the 19th century it underwent a restoration and many works of contemporary artists were added to the interior along with works donated from other Paris churches. FRANCOIS BONNET was born abt. 1565 at St-Nicolas Des Champs. His date of death is unknown as is the name of his spouse. His granddaughter would be the first of his family to sail for Quebec some time after her marriage. JEANNE BONNET was born Abt. 1600 in St-Nicolas Des Champs, Paris France, and died 23 April 1646 in St-Nicolas Des Champs, Paris France. She married NICOLAS RICHARD Abt. 1620 in Paris, France. He was born Abt. 1600 in St-Nicolas Des Champs, Paris France, and died Abt. 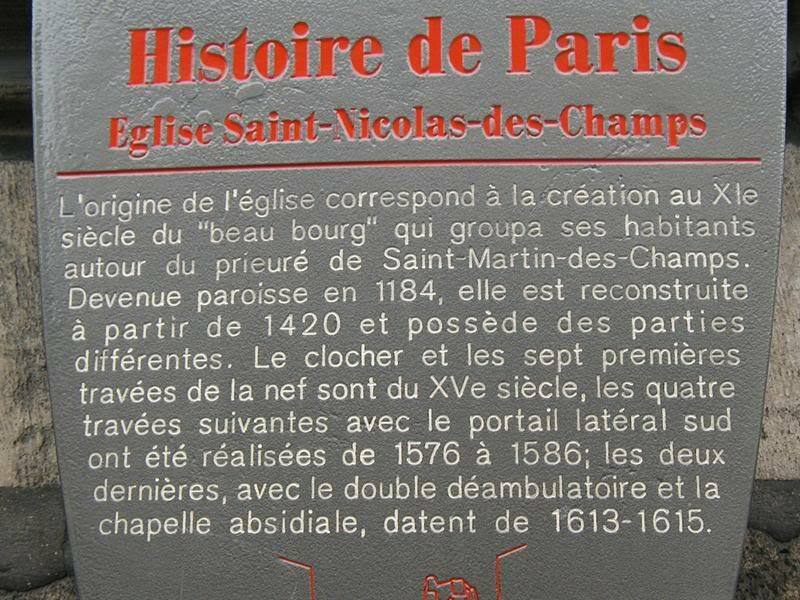 1632 in St-Nicolas Des Champs, Paris France. Their daughter MARGUERITE RICHARD (JEANNE1 BONNET) was born Abt. 1630 in St-Nicolas Des Champs, Paris France, and died 23 April 1708 in Lorette, Québec, Canada. She married JEAN (DIT LAVIGNE) LEVASSEUR 23 April 1646 in St-Nicolas Des Champs, Paris, France, son of NOEL LEVASSEUR and GENEVIEVE GAUCHER. He was born Abt. 1622 in Bois Guillaume, Rouen, Normandie, France, and died 31 August 1686 in Quebec, Canada. The Church of Saint Nicolas des Champs is dominated by a beautiful tower which dates from the 15th century, the top portion dates from the 17th. Parts of the nave date from the first construction of the present building in 1420. The Renaissance portail on the south side was built in the 16th century and was inspired by a drawing by Philippe de l'Orme, the architect to King Henri II. Philippe de l'Orme was also responsible for the early design and beginnings of the Palais de Tuileries. 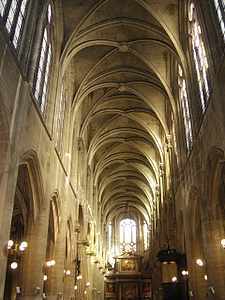 Although it now has a fairly rough exterior owing to its long life and to the rise and decline of the area, the interior of the church of Saint Nicolas des Champs is quite remarkable for its light and beauty. Twenty five large windows account for the luminous quality and add greatly to the richness of the interior decoration. There are many wonderful masterpieces in the Church of Saint Nicolas des Champs from across the centuries attesting to her once prominent place in the life of the City. This work was created in 1863 by the City of Paris and executed by the artist Leon Bonnat and tells of an episode in the life of Saint Vincent, the helper and protector of the poor. A work of the 16th century by Gaudenzio Ferrari, this painting is rich in allegory and symbol, retelling the story of Jesus' baptism in the river Jordan by John the Baptist. The work of Georges Lallemant painted in 1620, depicts the scene of Jesus being taken down from the cross. This work of Hilaire d'Olivet from the 18th century was for years attributed to another artist until the end of of the 19th century when a cleaning and restoration revealed the original signature and the error was rectified. It is a wonderful painting depicting an episode in the life of the early 4th century saint and bishop of Hippo in present day Algeria. The artist Jean-Baptiste Pierre was the First artist to the King in 1770. This painting was made to imitate a bas relief sculpture. It depicts one of the many miracles attributed to the great Saint. This work by Frans Pourbus was painted in 1618 and is a magnificent and imposing work. The retable is the work of the master Simon Vouet and was created in 1629. It depicts two scenes from early Christianity, the Burial of Mary and her Assumption into heaven. It is a remarkable work from the 17th century. As can be seen from this wide array of works, this was once the center of a vibrant parish life and continues to this day as a presence in the area.